This project is a theatrical response to questions that arose from the Fukushima nuclear disaster and the Tohoku tsunami: What are our voices and how can we hear them? The project features a refrigerated truck converted into a video installation with viewing booths and “Referendum Project” written on the outside. Visitors can enter and select DVDs to watch. Junior high school students from Tokyo and Fukushima were interviewed with the same everyday questions: What do you want the most right now? What would you do if you were prime minister? What will Fukushima/ Tokyo be like in the future? What do you understand the least right now? What is your dream? The audience is free to watch whichever and how many DVDs they want. Afterwards, they too are asked the same questions; they write their answers on a “ballot paper” and place it in a quasiballot box. These “votes” are then published on the project website, together with the students’ interviews forming an archive of the voices of people in Japan. The project collects the voices of students too young to participate directly in politics, and asks audiences to consider larger questions that are not simply a case of for or against. In this way, the work is a national referendum in the form of a theatre project. In 2011, the truck and its voices first went on a tour around Tokyo and Fukushima. During the onemonth “performance” talks were held at each stopping point, inviting guest speakers to discuss postwar Japanese politics, policy-making, and culture. These talks were later published. In 2012, the Referendum Project toured the areas in Tohoku hit by the 3.11 disaster. In spring 2014, it visited Hiroshima and Nagasaki. The project is ongoing, continuing to add new junior high school student interviews and audience “votes” and build up a body of post-2011 voices. 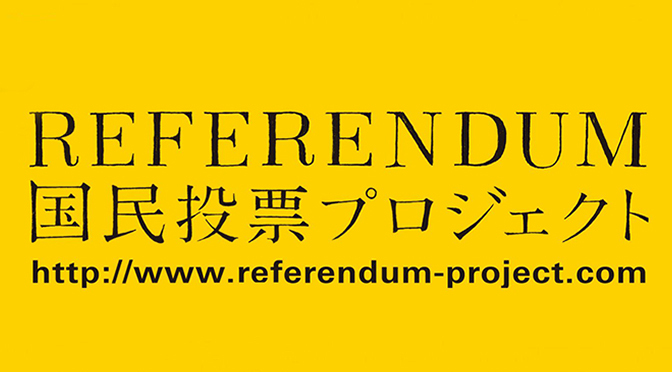 The interviews featured in “Referendum Project” have been exhibited at Art Tower Mito, Wiener Festwochen, the Schouwburg Theater in Rotterdam, Hebbel am Ufer in Berlin, and Künstlerhaus Mousonturm in Frankfurt am Main.